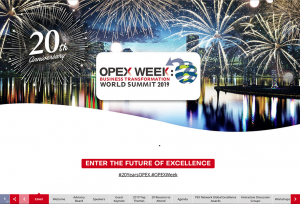 DHD have produced the digital event guide for OPEX Week: Business Transformation World Summit which takes place on January 21-25, 2019 at The Omni Orlando Resort, Florida. With 1000+ attendees, 800+ transformation leaders, 150,000+ community members and 150+ international speakers, OPEX Week is your opportunity to learn everything you need to accelerate your business transformation through process, people, technology and customer excellence! It’s been 20 years of disruptive innovation… From the birth of the smart phone to the rise of the shared economy, virtual currency and AI, the business world has faced a period of unprecedented change. A new era is dawning: size is no longer a guarantee for success, business models are turned upside down, and relationships are being redefined. What has proven successful in the past will no longer be sufficient. To stay ahead, it’s imperative for organizations to innovate, “fail fast”, reinvent and transform. Over this exciting time, OPEX Week has deeply rooted itself in the world of process excellence and business transformation, leading the way in showcasing practical and innovative approaches businesses are using to transform their process and customer experience, in the context of all this change. And what a journey that has been! From lean six sigma to design thinking, from BPM to Robotics, from process improvement to disruptive 10x performance, from internal process mapping to customer facing journey development, the scope and depth covered by our annual flagship event has been deep and wide. 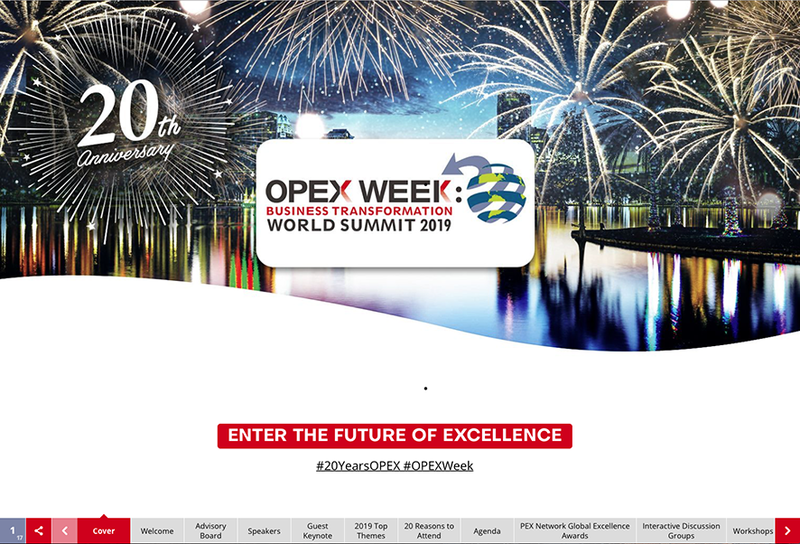 In our 20th anniversary year, the 2019 OPEX Week: Business Transformation World Summit captures the key theme of riding this incredible pace of change by leveraging the elements of Process, People and Technology to drive impactful business transformation. OPEX Week houses the most comprehensive and progressive OPEX strategies, best practices and tools. In 2019, you will hear from 150+ inspirational speakers from the world’s leading brands.